Silly question about combining golf cart batteries. 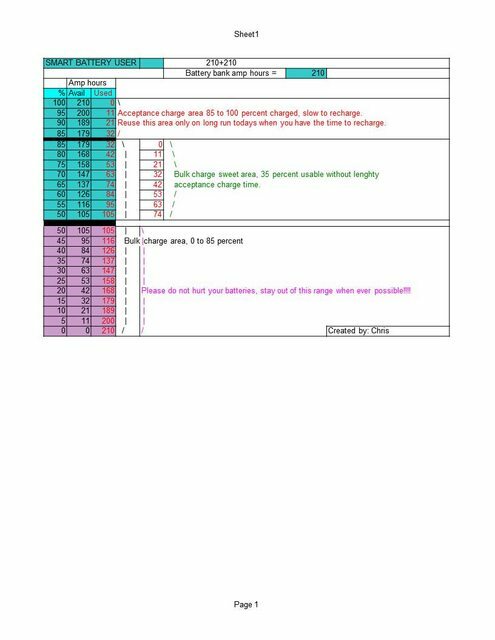 If a 6 volt golf cart battery has a listed life of 210 amp hours, when you combine 2 of them to make 12 volts is their combined life still 210 amp hours @ 12 volts because it's going to behave like 1 big battery or does the life double to 420 amp hours? I'm still unclear if the golf cart battery upgrade is the best way to go for boon docking. Your first guess is correct. You can add voltage or amps, not both. My ride is a 28 foot Class C, 256 watts solar, 556 amp hours of AGM in two battery banks 12 volt batteries, 3000 watt Magnum hybrid inverter, Sola Basic Autoformer, Microair Easy Start. Another thing to keep in mind is that golf cart batteries can be discharged to a much lower level than 12V batteries and fully recover when charged. Main reason is that golf cart batteries have solid lead plates, not the lead/foam sponges that most 12 Volt batteries have. If you don't believe me, go to a store that sells both, and pick up each battery! Only way to go when boon docking for a long weekend. I replaced two Trojan T-105's last October after 8 years full time use including several boondocking trips every year. They still worked OK, but one of them was getting tired so I retired both and installed the Trojan watering system on the new ones. Now the routine water addition is a piece of cake. I sold my TT 4 years ago with 2- T-125Trojans batteries, still going strong after 10 years. It was a no brainer to buy 2 for our new to us TT. The thing with batteries is if you discharge them below 50% you shorten their life. I installed a Trimetric Battery Meter and that lets me know % of charge all the time. Its on the wall facing the door so when I open the door its visible. I also check the fluid level before and after every trip. We dry camp a lot and charge the batts with 428 watts of solar. So as soon as the sun comes up, there charging. The question was "amp hours" or "available power". In both cases, your available power will roughly double.....right ?? CanAm Spyder in the "trunk"
Now the routine water addition is a piece of cake. My "routine watering" does not exist. I have deep cycle AGMs. Expensive but well worth it, in my opinion. The plates are not solid lead. However, they are thicker. Main reason is that golf cart batteries have solid lead plates, not the lead/foam sponges that most 12 Volt batteries have. If you don't believe me, go to a store that sells both, and pick up each battery! Only way to go when boon docking for a long weekend. What Crabby is saying is true. GC batteries like other lead acid batteries should be used in their upper half of available amp hour. Going below 50 % will shorten the life of the battery. Recharging from 50% to 85% can happen quickly with the correct charging system. From 85% to 100% the battery tapers off slowly on how much current it will accept, so this phase of recharging can take many hours. 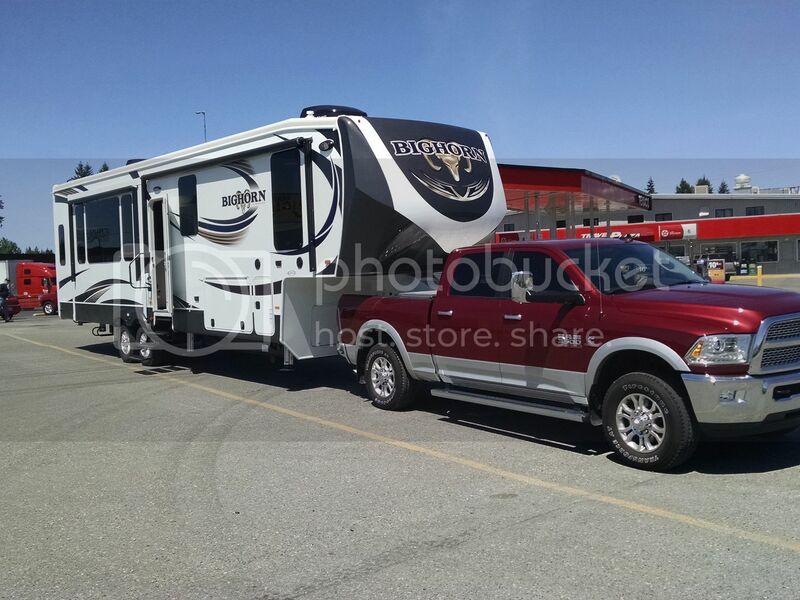 2015 RAM 3500 CC SB SRW Our Rig New 2017 Bighorn 3575el. Commuter trailer 2019 Laredo 225MK. Retired and enjoying it!